Oriel windows are a type of bay window that adds unique character to both the inside and outside of your home. Many kinds of bay windows require a custom build and installation, but they are still well worth the extra costs. Oriel windows are known for their quality and beautiful architectural details. Oriel windows are a type of bay window with a prism like shape jutting out from the edge of the building without touching the ground. They are a way to add a bay window without requiring support from the ground, so they are commonly found on the second or upper floors of homes. A bay window is an excellent feature to have in terms of resale value, so adding Oriel windows is a smart remodeling choice. Oriel windows can provide added floor space, ample sunlight, or a cozy window seat without having to take up an extra inch of lot space. This makes them a perfect option for upper floors and crowded city spaces. They are typically built to custom specifications, so you can get one as small or large as you would like. You can build Oriel windows that go all the way to the floor, or you can get a smaller window that can go above your countertops, making a perfect sunny nook for plants or decorative items. Custom projects typically don’t come cheap. If possible, try to get a standardized size so your replacement costs will be less expensive. As with any bay window, they will be more expensive than ordinary windows. You get the beautiful architectural detail and make the inside of your home appear larger. It also has more window glass, letting in more light. Because Oriel windows provide extra features, use more materials, and require more labor to build and install, they are going to be more expensive. The cost vary widely based on what brand or materials you choose. The only way to get an accurate estimate of their cost is to talk to a local contractor. Oriel windows can make a space feel much larger without having to actually knock down walls and expand the room. It is a perfect solution for cramped spaces, because it gives the illusion of a larger room. Oriel windows also let in far more light than traditional windows. These windows fit three panes of glass into the space for one window, allowing a great deal of natural light to enter your room. If you have a room that is far too dark, an Oriel window is the perfect solution to brighten things up and allow more air flow. Oriel windows also let you take advantage of a beautiful view, even more so than a picture window. Just imagine having a cozy window seat looking out on a beautiful view of your surroundings. If you live near the beach or have any other scenic view, an Oriel window lets you maximize the view. 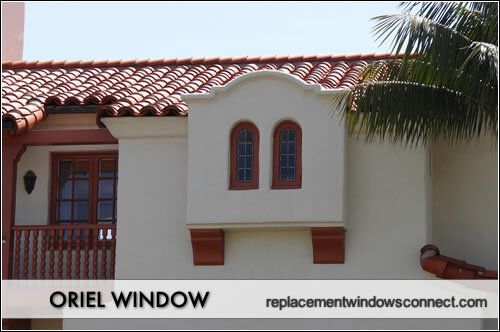 Oriel Replacement windows are fairly easy to maintain. You have to do regular cleaning and repairs to keep the windows in optimal condition. You should wipe down the windows and the frames at least once a year, with a non-abrasive cleaning solvent. Read more on proper maintenance. The only real downside to Oriel windows is the price tag. Oriel windows cost more money and take longer to install because they are typically a custom build. But you have to consider whether the added benefits make the extra costs worthwhile. There are numerous window manufacturers that offer a wide range of products to fit virtually any budget. You might not see Oriel windows advertised by the companies, because they are not a very common type of replacement window. But if you ask, you will find that a majority of the major window companies do produce Oriel windows, despite the fact that they rarely advertise them.